Benjamin Hudson McIldowie (born 26 June 1979), better known by his stage name Mr Hudson, is an English musician from Birmingham, England. First rising to prominence in 2006, with Mr Hudson and the Library, Hudson later embarked on a solo career in 2008, when he signed a record deal with American musician Kanye West's GOOD Music label. He was subsequently featured as a prominent composer on West’s 808s & Heartbreak (2008). Hudson later appeared on American rapper Jay-Z’s Top 10 single "Young Forever", from The Blueprint 3 (2009). He would find more solo success on his 2009 album, Straight No Chaser, which spawned the hit single "Supernova". Establishing his own studio in 2010 Hudson began writing and producing for other acts including Paloma Faith, Alex Clare, Pixie Lott, and Wretch 32. He then spent most of 2014 in the studio with Duran Duran, working on their album Paper Gods. Since then Hudson has gone on to co-write, produce and/or feature with Future, DJ Snake, Vic Mensa, and many more. His co-writes with JP Cooper for singles "September Song" and "She's on My Mind" have both sold millions of copies. Born in Birmingham, Hudson grew up in the Handsworth area of the city (Dudley Road) and attended King Edward's School, Birmingham in Edgbaston. He attended Oxford University, where he read English Literature at St Anne's College, Oxford. Before Mr Hudson formed 'Mr Hudson and the Library' he was in 'Mansize', 'The Hudson Sound' and 'Phoenix Green'. 'The Hudson Sound' and 'Phoenix Green' featured Ali Forbes, Jarvy Moss, Ben Westwood and Mr Hudson's brother Jon McIldowie. They enjoyed considerable success in the Birmingham area and elsewhere with a regular spot at Ronnie Scott's in Birmingham. 'Mansize' featured later collaborator Robin French. Hudson embarked on his music career when he formed Mr Hudson and the Library, composed of Maps Huxley aka Robin French (bass), Wilkie Wilkinson (drums), Joy Joseph (steel drums, vocals) and Torville Jones (piano). The first result, an EP entitled Bread & Roses, came out via Deal Real in October 2006. The group toured with Amy Winehouse in early 2007 in support of their debut album, A Tale of Two Cities, released through Deal Real/Mercury. Mr. Hudson was first featured on Later with Jools Holland on 8 December 2006. The production on the band's debut album uses acoustic guitar interspersed with piano, backing vocals and bass guitar, steelpan, electric drums and unusual rhythm patterns. Two of the tracks from A Tale of Two Cities are covers; "On The Street Where You Live", is a cover of a number from the musical My Fair Lady and "Everything Happens to Me" was popularised by Frank Sinatra and Chet Baker. In 2007, Mr Hudson and the Library embarked on a tour through twelve British libraries as part of the 'Get It Loud' initiative, and also supported Amy Winehouse on her tour, along with Paolo Nutini, Mika and Groove Armada. During the summer of 2007 they appeared at several UK festivals, including Glastonbury, T in the Park, The Big Chill, V Festival, Godiva Festival, and Bestival. In October 2007, the band played at the Millennium Stadium in Cardiff in support of The Police. They also supported Kanye West on his Europe leg of his Glow in the Dark Tour, performing in Dublin, Belfast and other European cities. 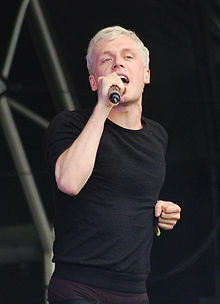 In 2008, Mr. Hudson began recording as a solo artist. Although the name 'The Library' was no longer used, these musicians formed his backing band for live performances. Sessions for Straight No Chaser initially started at Gizzard Studios in Bow, East London. Ed Deegan who had previously worked at Toe Rag Studios near by was acting as engineer, but Mr. Hudson received an offer from Kanye West to produce his album. Mr. Hudson appears on Kanye West's fourth album, 808s & Heartbreak featured on "Paranoid". He also co-produced "Street Lights" as well as supplying additional vocals on "Say You Will" and "Amazing". Kanye West has stated: "I believe Mr. Hudson has the potential to be bigger than me, to be one of the most important artists of his generation". The single Supernova was premiered on 13 May 2009 on Zane Lowe’s BBC Radio 1 show and then released on 19 July 2009. It debuted at Number 2 in the UK singles chart on 26 July 2009. Calvin Harris remixed the track. Mr Hudson's new album – Straight No Chaser was released on 4 August 2009 (via GOOD Music and Mercury Records), executive produced by Kanye West. "I wanted to make a mainstream record, not structured or ornate," he explains. "The first album feels like an Escher drawing, all these layers and you don't know where you're going at any point. The way the songs are written and produced on this one is much more direct. It's not trying to reinvent the wheel. It's straight, no chaser." In an interview, singer Ben Hudson was asked to describe the album: "My mission statement was to make a pop record, but not a throwaway pop record. My heroes are people like Bowie and Prince and Damon Albarn. I didn't want to do anything niche. Kanye threw down the gauntlet. He said, 'Let's see if we can make you a popstar'. I was like 'Let's have a go!'. It's a bit more widescreen, a bit more punchy, but the eclecticism of the first record's still there. There's a tune where I'm a cross between Deliverance and Sade". In 2009, Hudson guested on Playing with Fire by N-Dubz. In the autumn of 2009, Mr. Hudson supported Calvin Harris on his UK tour. Mr. Hudson’s headline tour to support the album Straight No Chaser was in October 2009. Before the year was out, Hudson made a featured appearance on Jay-Z's The Blueprint 3, the track, "Young Forever", was a reworking of Alphaville's 1984 song "Forever Young". In May 2010 Mr. Hudson embarked on a sold out national UK tour, with supporting Jay Z in Birmingham & Manchester arena shows plus Isle of Wight & Wireless festivals. In 2010, Mr. Hudson collaborated with British dubstep artist Caspa on the track "Love Never Dies (Back for the First Time)", which is a new version of a previous Caspa track known simply as "Back for the First Time". Rapper Nero appeared on the remix. On 29 July it was named by BBC Radio 1 DJ Zane Lowe as his Hottest Record in the World Today. Mr. Hudson was featured on Jay-Z and Kanye West's album Watch the Throne (2011), appearing on "Why I Love You". In 2012, Hudson began writing and producing tracks for Josh Kumra, He also worked on "Hand of Cards" for The Voice runner-up Tyler James, on his 2012 album A Place I Go. Hudson was later featured on the UK Top 10 single "Charge", by Sway. 2012 also saw Mr. Hudson release an album with Rosie Oddie, under the name BIGkids. The first single "Heart Sing", from their collaborative effort, titled Never Grow Up, was released on 12 August 2012. The album itself was released 7 October 2012. In March 2013, Mr. Hudson debuted the new single "Fred Astaire" via SoundCloud. "Fred Astaire" would later be released as a commercial single in August of the same year, with accompanying video directed by prominent English portrait and fashion photographer Rankin and photographer Vicky Lawton. Since then he has released additional tracks taken from the album: "Move" with Rankin shooting the video exclusively for Hunger TV, in December 2013 and "Step Into The Shadows" featuring Idris Elba in May 2014. He is finishing work on his second solo album with the working title of Autumn In August. He said: "It feels like a comeback with a small ‘c’. I don’t feel like I’ve ever been away, but obviously if you’re not out there, with that A-list single on Radio 1, then maybe for the vast majority of people you are — for all intents and purposes — dead. I mean, the Twitter comments you get, ‘Are you dead?’ And you think, well if I am who are you tweeting? But it’s great to be putting music out. It’s great to have another record out and to be gearing up for the album." In November, Epic Records recording artist Future released the track "Real and True" featuring Miley Cyrus & Mr. Hudson in the US. The track was co written by Mr. Hudson with the video shot by photographer Rankin. December 2013 saw the release of Rebecca Ferguson’s album entitled Freedom with the track '‘Beautiful Design'’ which Mr. Hudson co wrote & produced. 2014 saw the release of Idris Elba's Idris Elba presents Mi Mandela on which Hudson features and co-produced. The same year Hudson collaborated with Paloma Faith on the track "Take Me" on her third studio album A Perfect Contradiction. Hudson spent most of 2014 writing and producing Paper Gods by Duran Duran, released 11 September 2015. Lead singer Simon le Bon had this to say of Hudson's involvement: "Him coming on board was a very crucial stage actually, it glued it all together. Before we had a bunch of different songs and he brought it together and gave it a direction. He also gave us the confidence to leave each other’s space, and this is the first time we have got this on an album." In October 2015, Hudson released a single titled, "Dancing Thru It", followed by the critically acclaimed "Hey You". 16 September 2016, Hudson’s co-write for JP Cooper’s "September Song" was released. 8 January 2017 appeared as a special guest at the Celebrating David Bowie concert at the O2 Brixton Academy with Gary Oldman & Mike Garson, singing a rendition of Bowie's "Starman". Hudson sang with Bowie’s band, Mike Garson, Gail Ann Dorsey, Earl Slick and more for the ‘Celebrating David Bowie’ shows in London, New York and Los Angeles. He has continued to tour with the line up in 2018 in the UK, Europe and the USA. Hudson’s features and co-writes in 2017 include with Vic Mensa "Almost There" for Mensa’s Masterpiece EP, "She's On My Mind" by JP Cooper, "Beatnik Trip" by Gin Wigmore and Bearson "Cold War". Hudson also released two of his own tracks late in 2017. "Can't Forget You" released on 29 September and "Coldplay" featuring Vic Mensa, world premiered on 5 December with Zane Lowe on Beats1 Radio. Mr. Hudson’s co-write with Alexander DeLeon ‘Zombie Love’ was released on 30 March followed by his track with Janelle Monáe feat Zoe Kravitz "Screwed" on 27 April, taken from the album Dirty Computer. Mr. Hudson appeared on Kanye West and Kid Cudi’s collaboration album "Kids See Ghosts" where he sang the outro to the final song, "Cudi Montage". Hudson’s co-write for Jonas Blue featuring Joe Jonas "I See Love" was released 29 June for the Hotel Transylvania 3 soundtrack. On 10 August Jake Shears' debut solo album was released. In which Hudson co-wrote the tracks "Clothes Off", "Mississippi Delta", and "Big Bushy Mustache". 26 October saw the release of Ray BLK’s Empress album in which Mr Hudson co-wrote and produced song titled "Just A Kid". Hudson co-wrote and featured on 'Deserve It' from Vic Mensa’s Hooligans EP, released on December 13 followed by his co-write with JP Cooper 'Cheerleader' on December 14. Faustix’s new single "Thorns" released on March 29 by Big Beat/Atlantic was co-written by Hudson. ^ O'Brien, Jon (4 August 2009). "Straight No Chaser - Mr. Hudson | Songs, Reviews, Credits, Awards". AllMusic. Retrieved 9 August 2014. ^ Ingrham, Tim. "Paloma Faith confirms new album, out March 10". Music Week. Retrieved 5 July 2015. ^ Panteli, Portia. "ALEX CLARE INTERVIEW". Drafted Magazine. Retrieved 5 July 2015. ^ "Pixie Lott – Young Foolish Happy". Discogs. Retrieved 5 July 2015. ^ Platon, Adelle. "Duran Duran Breaks Down Mr. Hudson, Nile Rodgers & Lindsay Lohan Collabos in Behind-The-Scenes Look at 'Paper Gods'". Billboard. Billboard. Retrieved 27 July 2016. ^ RUBENSTEIN, JENNA HALLY. "MILEY CYRUS HELPS FUTURE AND MR. HUDSON SING THE MOST DEPRESSING LOVE SONG EVER IN 'REAL AND TRUE'". MTV News. Retrieved 8 May 2017. ^ "Here Comes The Night (ID Remix) (feat. Mr Hudson)". BBC Music. Retrieved 8 May 2017. ^ Blais-Billie, Strauss, Braudie, Matthew. "Vic Mensa and Mr Hudson Reflect on Coldplay in New Song: Listen". Pitchfork. Pitchfork Media. Retrieved 1 April 2018. ^ "JP Cooper releases new promotional single "She's on My Mind"". Hamada Mania Music Blog. Retrieved 1 April 2018. ^ Thrills, Adrian (23 July 2009). "Play that funky music, white boy: Mr. Hudson aiming for the top spot". Daily Mail. London. ^ "Mr. Hudson & The Library – The Bread + Roses EP". Discogs. ^ Sullivan, Caroline. "Mr. Hudson and the Library, A Tale of Two Cities". Guardian. The Guardian. Retrieved 5 July 2015. ^ "Later...With Jools Holland Episode 6 Later... with Jools Holland, Series 28 Episode 6". BBC. Retrieved 5 July 2015. ^ "Get It Loud In Libraries". Never Enough Press. Retrieved 5 July 2015. ^ Reid, Rasheem (24 November 2008). "Kanye West says Mr. Hudson 'Could be bigger than me'". MTV (media). Retrieved 24 November 2008. ^ N-Dubz ft. Mr Hudson - 'Playing With Fire', Fraser McAlpine, BBC Radio 1 Chart Show, 14 January 2010. ^ Lowe, Zane. "Zane Lowe's Hottest Records blog: Caspa ft. Mr. Hudson – Love Never Dies (Back For The First Time)". BBC. Retrieved 1 February 2012. ^ Copsey, Robert. "Josh Kumra debuts 'Helicopters & Planes' music video". Hearst Magazines UK. Retrieved 19 February 2013. ^ "A Place I Go - Tyler James | Songs, Reviews, Credits, Awards". AllMusic. 22 October 2012. Retrieved 9 August 2014. ^ Copsey, Robert. "Sway, Mr. Hudson unveil 'Charge' music video". Hearst Magazines UK. Retrieved 19 February 2013. ^ Huynh, Davis (10 July 2013). "Mr. Hudson – Fred Astaire". Hypetrak. Retrieved 9 August 2014. ^ "BEHIND THE SCENES: MR HUDSON – MOVE". Hunger TV. Retrieved 4 December 2013. ^ "Mr. Hudson feat. Idris Elba – Step Into The Shadows [Lyric Video] – SB.TV – The UK's leading online youth broadcaster". Sbtv.co.uk. 8 May 2014. Retrieved 9 August 2014. ^ McCain, Natalie. "MR HUDSON BIOGRAPHY". Retrieved 9 July 2015. ^ Foster, Alistair (6 August 2013). "Mr. Hudson's back ... and he'd like to work with the Queen - Celebrity News - Showbiz - London Evening Standard". Standard.co.uk. Retrieved 9 August 2014. ^ "Future Premieres 'Real And True' Video Ft. Miley Cyrus". MTV Networks. Retrieved 4 December 2013. ^ Cogan, Judy (14 November 2013). "Freedom to revamp: Rebecca Ferguson performs new single on Paul O'Grady Show in high fashion sci-fi print dress". London: Associated Newspapers Ltd (Daily Mail). Retrieved 4 December 2013. ^ Gill, Andy. "Idris Elba Presents mi Mandela, album review: A marvellous alliance of ancient and modern styles". Independent. Retrieved 5 July 2015. ^ "Paloma Faith Unites With Pharrell & John Legend On Third Album". forth1. Retrieved 9 July 2015. ^ Badra, Cat. "DURAN DURAN'S NEW ALBUM IS "EVERYTHING YOU EVER WANTED FROM A DURAN ALBUM"". Duran Duran. Retrieved 5 July 2015. ^ Flanagan, Emma. "Simon Le Bon on Duran Duran tour and working with Mark Ronson on new album". Manchester Evening News. Retrieved 5 July 2015. ^ ROSSIGNOL, DERRICK. "PREMIERE: MR. HUDSON – "DANCING THRU IT"". Pigeons And Planes. Retrieved 27 July 2016. ^ Toro, DJ. "DJ Snake Humbled by Instant Success of Star-Studded 'Encore'". 923 Amp. CBS Local Media. Retrieved 15 August 2016. ^ POWELL, KARLIE. "DJ SNAKE'S 'HERE COMES THE NIGHT' GETS REMIXED BY NGHTMRE, CRANKDAT & MORE [LISTEN]". YOUREDM. Retrieved 8 May 2017. ^ Reilly, Nicholas. "David Bowie's gig at Brixton Academy was the celebration of his life that we needed". Metro. Retrieved 8 May 2017. ^ Manno, Lizzie. ""Celebrating David Bowie" Reveals Special Guests for North American Tour". Paste Magazine. Retrieved 1 April 2018. ^ Platon, Adelle. "Vic Mensa Unleashes New Project 'The Manuscript' Feat. Pharrell, Pusha T & Mr. Hudson". Billboard. Retrieved 10 July 2017. ^ "JP Cooper releases new promotional single "She's on My Mind"". HAMADA MANIA MUSIC BLOG. Retrieved 26 July 2017. ^ "GIN WIGMORE - BEATNIK TRIP". IHOUSEU. Retrieved 12 September 2017. ^ "Bearson Unveils Mr Hudson Collaboration 'Cold War'". Broadway World. Retrieved 12 September 2017. ^ Sodomsky, Sam. "Mr Hudson Returns With New Song and Video: Watch". Pitchfork. Pitchfork. Retrieved 1 April 2018. ^ "Listen to "Mr. Hudson and Zane Lowe" posted by Zane Lowe on Apple Music". Apple Music. Retrieved 1 April 2018. ^ "Janelle Monae premieres music video for new single "Pynk"". HAMADA MANIA MUSIC BLOG. Retrieved 1 May 2018. ^ "Jonas Blue Premieres New Song "I See Love" featuring Joe Jonas from the Hotel Transylvania 3 Soundtrack". pm studio world wide music news. Retrieved 11 July 2018. ^ Swift, Jacqui. "SCISSOR SISTERS SPLITTER Jake Shears talks about life after the Scissor Sisters and why he's decided to release a solo album". The Sun. Retrieved 30 August 2018. ^ "Just A Kid RAY BLK". Genius. Retrieved 30 October 2018. ^ Goddard, Kevin. "Vic Mensa Teams Up With Mr. Hudson On "Deserve It"". Retrieved 31 January 2019. ^ Brunila, Teemu. "Cheerleader (Demo) JP Cooper". Retrieved 31 January 2019. ^ "Faustix ‎– Thorns". Discogs. Retrieved 7 April 2019. ^ "Antidote Mr. Hudson". Genius. Retrieved 19 April 2019. Wikimedia Commons has media related to Ben Hudson (musician). This page was last edited on 19 April 2019, at 07:45 (UTC).